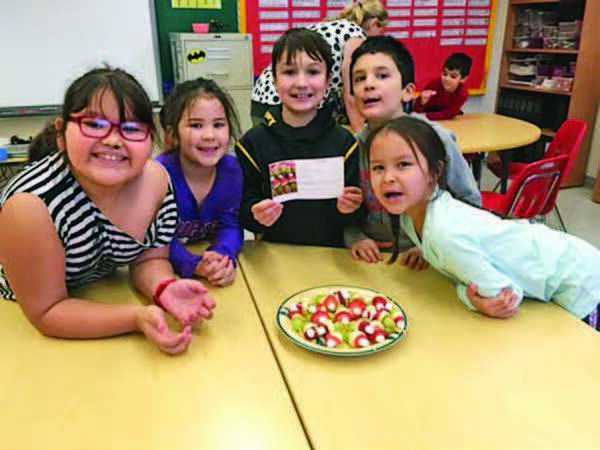 Canadian Natural has a made a long-term commitment of $460,000 in funding to The APPLE Schools Foundation, a registered charitable organization that provides funding to schools across northern Alberta to create healthy school communities. This partnership with APPLE supports the implementation of this program in remote northern school areas, many of which are First Nations or Métis communities (Lac La Biche, Cold Lake, Glendon, Anzac, Conklin, Janvier, Fort McKay and Fort Chipewyan). The program is research driven and has been improving the lives of more than 100,000 students in 63 northern Alberta schools over the last 10 years, working with parents, students and teachers. Students at APPLE schools incorporate more fresh fruits and vegetables into their diets, increase their physical activity levels, and learn how to care for their mental health. Students at the Fort McKay School hold up a recipe for their Grinch kabobs. The Northern Lights Health Foundation and Canadian Natural have a long-standing partnership to support health and wellness in the Regional Municipality of Wood Buffalo. Over the years, we have provided medical equipment, supported health programs and revitalized health service spaces to support both urban and rural communities. We also helped in bringing the first ever CT scanner to the region. 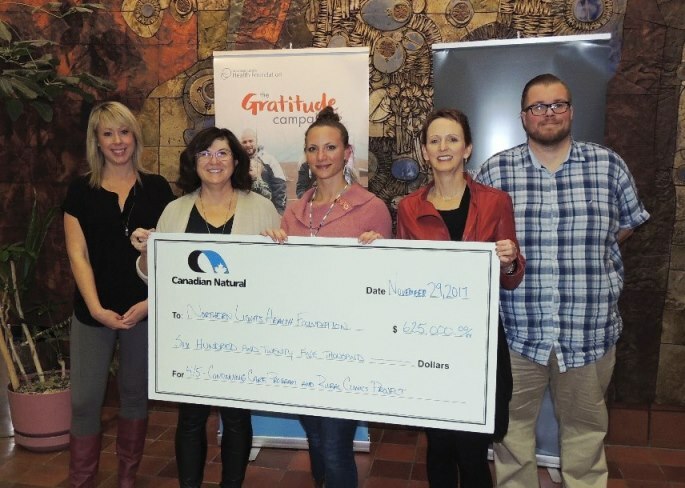 Canadian Natural is also donating $625,000 over five years to the Foundation’s Gratitude Campaign to support two important renovation projects: the Continuing Care unit of the Northern Lights Regional Health Centre in Fort McMurray (for long-term residents care), and the refurbishment of the Community Clinic in Conklin. All upgrades to the facilities were designed to provide safer, cleaner and more effective care for patients. For long-term residents of the Continuing Care unit at the Health Centre, some requiring care 24 hours per day, having a comfortable and friendly space is crucial to their health and well-being. Renovations included new furniture, flooring, lighting and paint. Updates to the clinic in Conklin occurred in 2017 and have provided a more welcoming and professional atmosphere to individuals and families, with new furniture, furnishings and paint. Northern Lights Health Foundation and Canadian Natural staff during cheque presentation.